Welcome to Awal Hotel, a new business boutique hotel in Libya's capital city Tripoli. Awal Hotel offers the highest standard of quality accommodation and hospitality, exceeding the needs and demands of business and corporate travellers, as well as holidaymakers in Libya’s capital city. As an affordable boutique hotel, Awal Hotel offers 28 guest rooms, each with ensuite bathrooms, as well as service amenities within a safe and clean environment. The spacious and stylish rooms are perfect for busy corporate travellers who are looking for respite after a busy day of meetings. Rooms are equipped with satellite TVs with multilingual channels, and Wi-Fi access, plus a sizeable workspace. This boutique business hotel offers its guests comprehensive services from a wake-up call in the morning to transport arrangements. In this fully-air conditioned hotel, guests have access to print, scan, copy and fax services, in addition to two guest computers in the lobby, both of which have Internet access. Daily breakfast is offered within the hotel restaurant, while Awal Hotel’s cafeteria is open to provide travellers with a quick stop for beverages and refreshments. The cafeteria caters to guests who are on the go, as well as guests who may wish to relax in the lobby. Guests are encouraged to ask the knowledgeable Awal Hotel staff at the 24-hour reception for recommendations for Tripoli’s top restaurants. 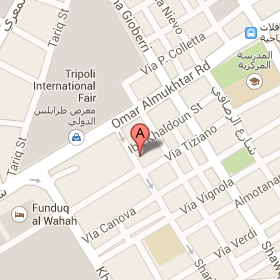 Awal Hotel is a perfect base for both the leisure and business traveller as it is located in the heart of Tripoli. It is conveniently situated in Errebiya Elarbi Street, formerly known as El Meseera El Kubra Street, just off Omar El Mokhtar Street. Hotel guests also benefit from a large car parking area that is situated right in front of the hotel. Additionally, the hotel is within walking distance to the Tripoli International Fairgrounds, Tripoli's foremost business towers, Tripoli's historical centre, as well as numerous restaurants, cafeterias and commercial retail outlets. The hotel is also within close proximity of the coast. As the capital city of Libya, Tripoli is home to a number of historical sites, including the Old City, the Assaraya al-Hamra Museum (Red Castle), the Marcus Aurelius Arch, as well as the Al Nagha and Ahmed Pasha Karamanli mosques. Awal Hotel staff can also help to make travel arrangements to the Roman cities of Leptis Magna and Sabratha. Click here to download the hotel brochure in PDF format.